The EPA has announced the official fuel economy numbers for the 2014 Dodge Durango and thanks to the new 8-speed automatic transmission, the revised Durango offers the best fuel economy of V6 and V8 powered large sport utility vehicles sold in America. The 2014 Dodge Durango powered by the 3.6L Pentastar V6 and sending 290 horsepower to the rear wheels via the new 8-speed automatic transmission offers 18 miles per gallon in the city, 25mpg on the highway and a combined figure of 20mpg. When compared to the smaller and less powerful Chevrolet Traverse and Ford Explorer with their standard V6 engine options (not including the 3.5L EcoBoost in the Explorer Sport which is more powerful than the Pentastar V6), the Durango is comfortably the best choice for those buyers who rate fuel economy as one of their top concerns when shopping. The Ford Explorer with the 3.5L V6 in front wheel drive form offers 17mpg in the city, 24 on the highway and 20 combined while the Chevrolet Traverse front wheel drive models with the 3.6L V6 offers just 17mpg in the city, 24 on the highway and 19 combined – numbers which make the Durango the most efficient V6 option on the market. 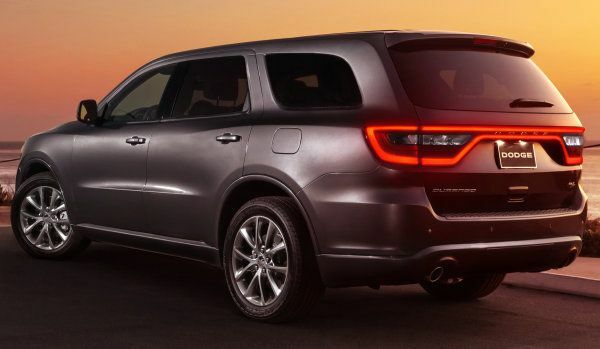 When you move up to the 2014 Dodge Durango with the Pentastar V6, the 8-speed transmission and all wheel drive, the Durango’s fuel economy figures drop to 17 in the city, 24 on the highway and 19 combined. The Explorer with the naturally aspirated 3.5 returns just 17 in the city, 23 on the highway and 19 combined with all wheel drive while the Chevrolet Traverse offers 16 in the city, 23 on the highway and 19 combined so while the AWD V6 Durango shares a combined fuel economy figure with both cross town rivals – the Pentastar is more efficient than both on the highway and more efficient than the Chevy around town and on the highway. Those buyers who want more power and more capability can opt for the 2014 Dodge Durango with the 5.7L Hemi V8. Chevrolet does not offer a larger engine option and in the Ford Explorer, the 3.5L EcoBoost is offered as a premium engine rather than a V8. The Ford Explorer with the EcoBoost V6 and all wheel drive offers better combined and city fuel economy than the AWD Hemi-powered Durango, the Durango equals the EcoBoost’d Explorer on the highway with figures of 22mpg. Also, for those buyers who want the power and performance of the Hemi but without all wheel drive, there is a rear wheel drive option that includes the Hemi, the 8-speed automatic transmission and standard all wheel drive with 14mpg in the city, 23 on the highway and 17 combined. Ford and Chevy do not offer a premium engine option with two wheel drive. It should be noted that while the 2014 Dodge Durango offers better fuel economy figures of large V6-powered sport utility vehicles along with being the only vehicle in the class to offer V8 power AND the only vehicle to offer a premium engine option with two wheel drive, Ford does offer their super efficient 2.0L EcoBoost 4-cylinder engine with front wheel drive. That model – while being the least powerful option of the aforementioned SUVs – is the most efficient but it falls short in every other way when compared to the 2014 Durango.